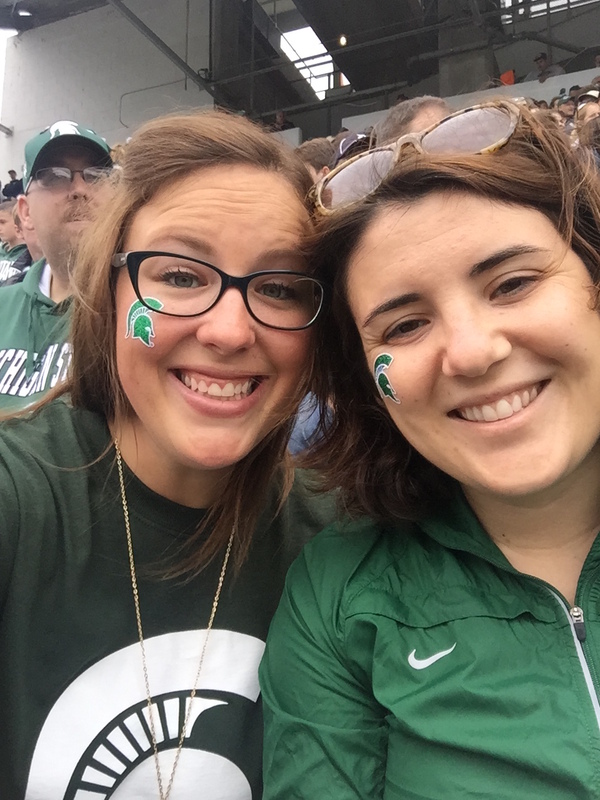 A few weeks ago I hopped on a plane and visited my BFF in the beautiful state of Michigan. An aside: I’ve been on a whole lot of planes this year, let’s call that the reason I’ve forgotten to write. Don’t worry friends. I’ve renewed the URL for a whole year. So you’re bound to get at least TWO blog posts out of that. Probably. Maybe. Anywho, we laughed. We dreamed. We hit up the local college football game (it is, after all, fall). I drooled over some Ethan Allen furniture. I stood in line for an hour to get into *thee* college karaoke spot. Glitter tattoos and a new hunter green colored shirt? That’s a sure fire way to get me to say yes to any adventure. Second aside: No joke, this place sold BUCKETS of beer. Not like a bucket filled with a few bottles of beer. Not like a fishbowl. Like a giant bucket you would put a mop in. Thirty year old Betsy thought it looked like death. Twenty two year old Betsy would have organized a party. Also, they had a cranky door man (not like Sheriff Woody) who lost all grump and became a total charmer when he saw my Nebraska license. “NEBRASKA!” He exclaimed. “The friendliest people I’ve ever met live there.” Heart melt. Here’s the really critical part of the story – in the 72 hour fog of running around town with one of my favorite people in the whole wide world – she received a package on her doorstop. 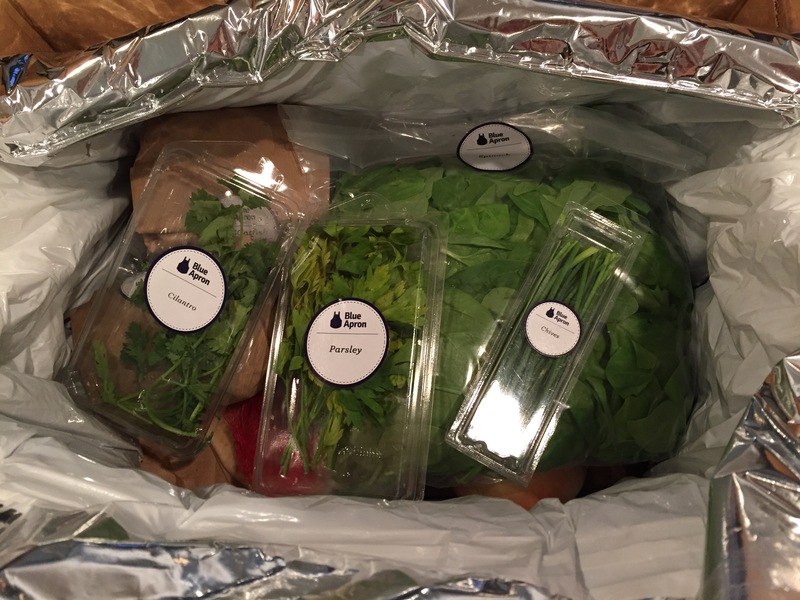 Her Blue Apron delivery of the week. Everyone – lean in , here’s where the story gets amazing – this box? It was magical. And out of it appeared fresh veggies, meat, and EVERYTHING ELSE YOU NEED TO CREATE THREE MEALS FOR THE WEEK. It’s like a non-domestic women’s dream. I stand paralyzed in groceries stores. What aisle should I go down? Should I have brought recipes? Do I want to cook this week? Should I make enchiladas again? How do these other women look so confident and assured of what they want to make?! Some genius (I have to believe woman) has put together a years worth of seasonal, fun, random, incredibly different recipes. And every week (or as often as you ask for) the exact portion for three meals comes to your door. With the step by step recipe guide. Like, the kind of guide that tells you the exact order of operations so that your meal all finishes at the exact same moment. Look! It’s everything you need. Seriously everything. And it’s so pretty. And pre-portioned. You’re just going to have to wash, chop and cook. And you’ll look amazing while doing it. I just know it! And so easily that I made a remoulade. See that little dollop on top? Yeah. I made that. It didn’t just come out of a can. Yes, I’ll say it again because I’m sure you’re dying and you don’t believe me right now. I. Made. A. Remoulade. 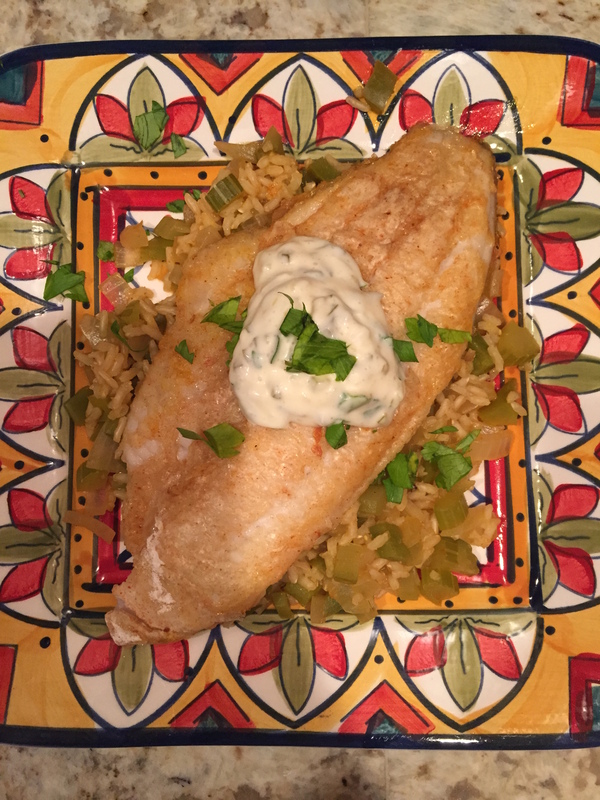 A remoulade as a side to my cajun catfish and dirty rice. I’ve never cooked fish in my life. 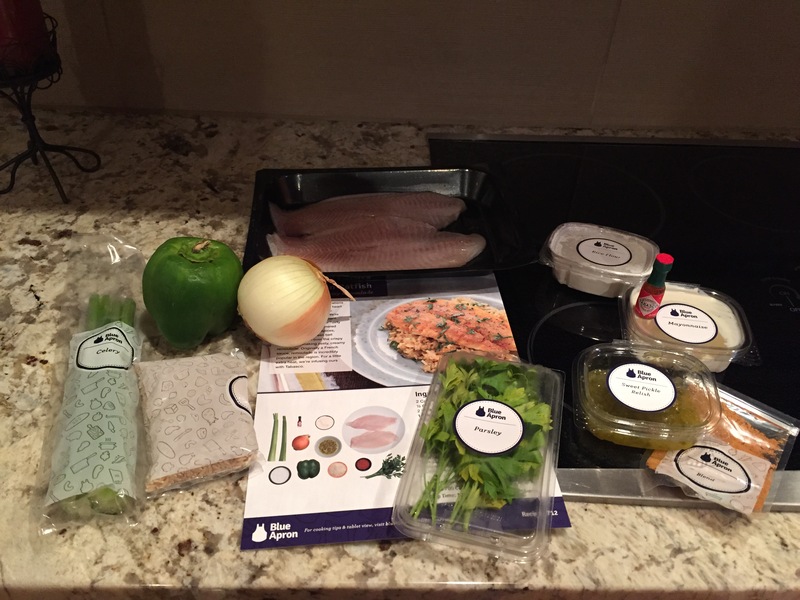 And I not only attempted it, but I dominated it thanks to my new best friends at Blue Apron. Like layers of adorable perfection. In a box. All perfectly chilled and ready for me to chop, cook and eat. I wish that I was like – AND TADA I CAN SEND YOU YOUR FIRST WEEK FO’ FREE BECAUSE I AM AN AMAZINGLY SUCCESSFUL BLOGGER AND THEY ARE HELPING ME DO A GIVEAWAY. I can’t do that. I can tell you that it’s $60 a week. For three meals. Each feeding 2 people. Sure. You can probably buy those groceries cheaper. Sure. You can probably eat healthier. And The Boy? Yeah. He even liked it. And it’s going to be worth every penny. Thank you world for creating a product where you’ve eliminated even my basic need to leave the home for the grocery store. I thought mail ordered yoga pants was genius (I have another pro rant for Fabletics if you ever want to hear it…), but this? On call steak in the mail? This is perfect. God bless America. *Pro tip: I did this the first weekend I moved into my house because I thought ‘wouldn’t it be magical if food just showed up on my doorstep and I didn’t have to venture out for yet another task.’ You do actually need to have oil olive and salt and pepper. That’s it. Every other spice, veggie, meat, garlic clove, butter chunk or mayonnaise bit is included. Sounds like the answer to anyone who is tired of planning and cooking meals.